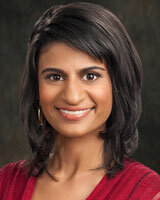 Pooja Lodhia joined KTRK and the ABC13 Eyewitness News team as a general assignments reporter in the spring of 2012. Before making her leap to Houston, she reported at Eatel News Magazine in Baton Rouge; WLUC in Marquette, Michigan; and WFTX in Fort Myers, Florida. Some of her most memorable stories include covering final space shuttle launch in Cape Canaveral, Hurricane Isaac in New Orleans, and a moose on the loose in Michigan. She truly believes that every person has a story worth telling, and she's honored to be able to do so. Pooja was born and raised in Baton Rouge, Louisiana and has family here in Houston. She has degrees in English Literature and Journalism and a minor in Modern Dance from Emory University in Atlanta. Pooja's hobbies include yoga, dance, reading fiction, and good conversation. She's a very social reporter so if you run into her, please say, "Hello!" She'd love to hear your personal story. If you'd like to know more about her, she encourages you to connect with her on Facebook and follow her on Twitter! Marijuana lovers all know that 4/20 is the unofficial holiday for the drug, but it's also the day that Houston is getting multiple new CBD shops! Building character and skill at a young age, that is the foundation of a program called "TIE."